Contrarily, with advances in medicine and diet, and the consequent increases in longevity, dementia, or the diminution of mental faculties, has seen rapid growth, with nearly 1 million sufferers in the UK. At present, there is no cure, but research indicates that exercise can delay the onset and on-going decline of the brain and its abilities. 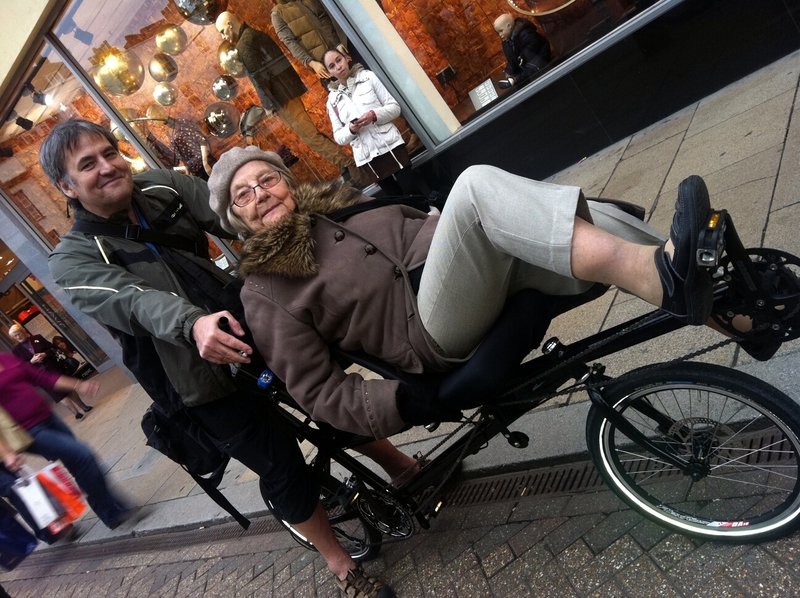 At a personal level, my mother had cycled until she was 82 – I was with her on her last solo ride into the country for dinner, and remember how alert and sprightly she was. With the coming winter and gradual diminution of her faculties, she never rode her solo again. Over the next few years, her deterioration continued, but with the development of the Morpheus, I wondered whether it might be possible to strap her onto the front seat and for her to pedal a bike again. It took some persuasion and I was in dread of the possible consequences, but that first ride was one of the most poignant moments of my life. For the first time in ages, she became engaged and interested, and this energy stayed with her for a few days. That first ride, we managed about 5 miles, but over the course of the summer we built up to a couple of rides approaching 20 miles. She always pedalled the whole way and it was clear that after each ride, she had a few days when she was energetic and aware, mentally and physically, well beyond her norm.